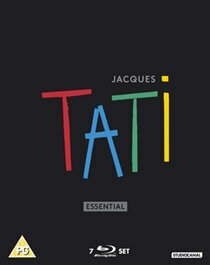 Collection of feature films from acclaimed French comedy actor and director Jacques Tati. Jour de Fete (1949) was Tati's directorial debut and became one of his most famous comedies. After observing the high-speed efficiency of the American postal serivice, the postman, François (Tati), of a sleepy French town is inspired to add a little excitement into his delivery route. This coincides with the arrival of the summer fair, and predictably, chaos ensues. Les Vacances De M. Hulot (1953) sees the introduction of the beloved character of Monsieur Hulot (Tati). As Hulot sets off on a holiday by the sea, accidents and severe misunderstandings follow him, leaving his fellow hotel guests less than happy. In Mon Oncle (1958), Monsieur Hulot returns with his brother-in-law, the manager of a plastics factory. When Hulot discovers that his nephew has been growing up in a house full of gadgets and gizmos, he tries to steer him away from a life of automation. In Playtime (1967), Monsieur Hulot returns, this time accompanying a group of female American tourists as they travel through Paris. Parade (1974) is a docudrama starring Tati giving a jovial observation of the circus, including the shenanigans that go on behind-the-scenes of the production. Trafic (1971) sees Tati play Monsieur Hulot for the final time. As he transports his innovative motorhome from Paris to a motorshow in Amsterdam, Hulot encounters many problems and hindrances including traffic jams, nose-picking drivers and car crashes. Presented in a bonus-packed Blu-ray box set edition, featuring an exclusive 48 page booklet.